The Ramons Entertainment was formed by Marilla Newman and Dean Ramon. They have been performing together for 18 years. With 30 years experience in the entertainment industry, we are true professionals having performed in India, New Caledonia, New Zealand, the UK and throughout Australia. Professionally trained as a classical dancer, Marilla toured the world performing in ‘Cabaret’ through East Asia, Europe, New York, Montreal and London where she performed with the ‘Carry On Gang’ at the Victoria Palace Theatre. Forming an adagio act called ‘Duo Arabesque’, Marilla performed around Australia and the East for five years, and represented Australia on the Hugh Green TV show in the UK. Returning to Australia, Marilla choreographed, costumed and produced shows which travelled to East Asia and worked with dancers around Australia, being nominated for the prestigious Mo Awards four times. Marilla met Dean, her partner, in New Zealand whilst choreographing and performing in a children’s pantomime. She has travelled with the Ramons Circus Spectacular, in New Caledonia, India the United Kingdom and Australia. Dean Ramon was born into a show business / circus family, originally from Christchurch New Zealand, where he trained to be a clown and performer. Dean first walked on stage at the age of 10 as a member of the family group. 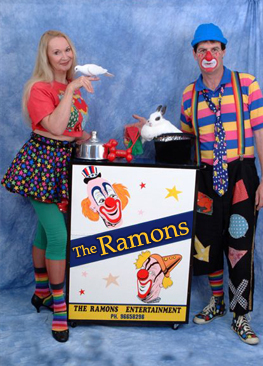 “The Ramons” even then, had two acts … comedy/magic and trick-cycling. By 1982 he went solo with another sensational act — the high wire. Dean is a gifted animal trainer amongst his many and varied talents, training and presenting dogs, horses, and farm animals. He is an Internationally renowned clown, known as “The Prime Minister of Fun and Happiness”. Dean has performed throughout New Zealand with all the leading circuses, and with the Ramons Circus Spectacular, in New Caledonia, India the United Kingdom and Australia.